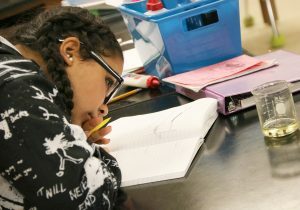 OSWEGO – A witch’s brew made its way into Tiffany Ryan’s recent eighth grade science lesson at Oswego Middle School. Alexus Miller, OMS eighth grader, observes a Halloween-themed science experiment as part of an introduction to an academic unit on chemicals and atoms in teacher Tiffany Ryan’s science class. For the recent lesson, students walked into their dark classroom where the black-light glow intrigued the budding scientists before they were asked to guess the substances in each illuminated beaker. Ryan explained that for one, tonic water contains quinine, which makes it glow. Ryan’s witch’s brew concoction began with pumpkin oil in beakers placed in front of students. She placed a few drops of red food coloring in each beaker, followed by Frankenstein’s ear wax, also known as Alka-Seltzer tablets, and then her students observed the following chemical reaction: as the tablet fizzed the food coloring spread, bubbled to the surface and went back down the beaker after bubbles popped. The gas particles in the oil caused the food coloring drops to move up and down, she said. The visual served as an introduction to a new unit on atoms, chemicals and density. Students were then tasked with outing together a periodic table of elements and color-coding them to separate metals, nonmetals and metalloids.